With the turning of the last calendar page and hopefully seeing January instead of the instructions on how to order a new calendar and a clever reminder to the owner to spring for the extravagant 18-monther instead of the bargain basement standard Gregorian model, I have decided to make a resolution. There are lots of potential resolutions I could make. For starters, stop leaving the toilet seat up (I live alone, but a guy can dream). Stop eating cheese in bed. No crustaceans after midnight. Tell the truth on my taxes. The one I’m going to actually stick to is to finally publish this review and let the gods sort it out. I’ve been tooling around with this game for about a month now, and this has been difficult to write. Why? I still don’t know. Perhaps I’m trying too hard and I feel uncomfortable with the fact that this review reads as if I’ve become a parody of myself. Perhaps it isn’t that good. Perhaps it’s so good that I have grown uncomfortable with my own greatness. One of those possibilities is correct. You be the judge. Ever wonder what sends you to Hell? Hell, with a capital H. You can postulate any number of reasons…most of them highly amusing. However, what happens when you actually get there? That’s where Holy Potatoes! What the Hell! comes in. That’s the name of the game, by the way, not a reaction to it. I’ve played a lot of games that anthropomorphized a wild variety of objects. Vehicles of all kinds, animals, aliens, even Italians are occasionally portrayed as human beings. Shocking as it is that my Mediterranean brethren have reached such heights in the cultural lexicon, one thing I’ve never played as is the lowly tuber. That’s right. Potatoes. And why shouldn’t we? After all, potatoes have played a role in society for millennia. Potatoes both caused AND solved the Irish Potato famine. Potatoes barely edged out babies for the solution to national food supply after Jonathan Swift’s brilliant “A Modest Proposal” hit the shelves. Did the Irish revolt against their soil-pocked gaolors? No! They welcomed the potato back with open arms, chopped it into a million pieces, pulled wee Seamus out of the pot, and threw the taters in there with a handful of gold coins or whatever they do over there. The point is that potatoes are finally getting their well-deserved time in the spotlight. Holy Potatoes takes place in Hell. 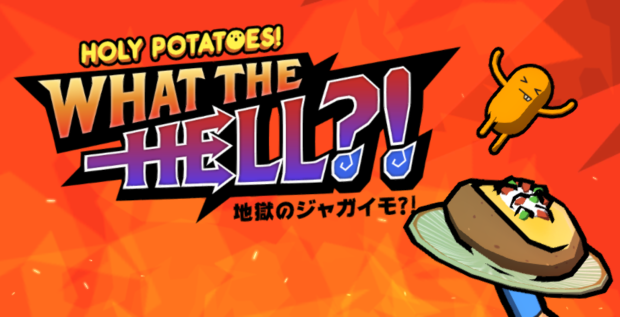 It starts right after your potato has met his (yes, in this game potatoes are binary-gendered) untimely demise and is ushered off to one of the higher levels of hell. There’s no reason given for why exactly you end up in hell, but given the interpretation of Hell, which most closely resembles Virgil’s version from the Divine Comedy, it could be for literally anything. 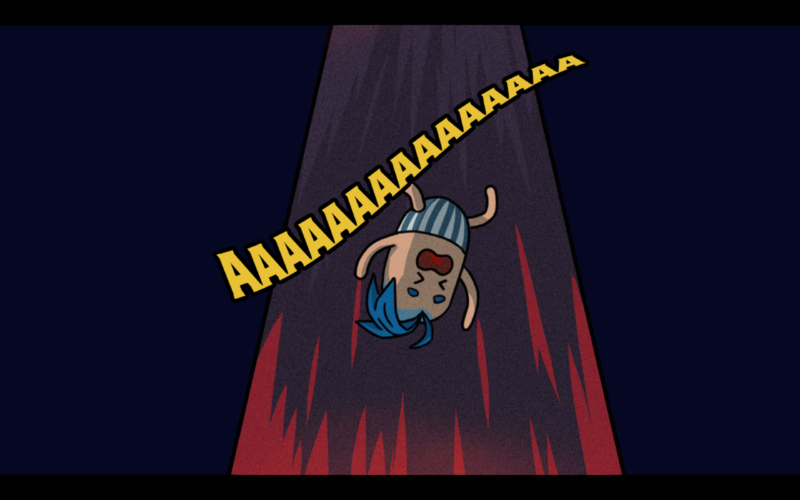 Once in Hell, you find yourself fully engaged in the meta-experience, in that you are consistently subjected to your own personal Hades in the form of a series of grueling, tortuous, pun-laden cutscenes. It happens a lot. Predictably after every round you get a cut scene that I’m sure someone finds hilarious. It’s funny, after playing this game for a few hours, my eyes just seem to roll back into my head and I wake up a few minutes later halfway through a round of play. It’s really amazing that I’ve made it so far. Once in the actual game, however, this one takes on a clever twist. Most of the action takes place in the kitchen, where your primary role is to sort hell-bound potatoes into variously colored cooking stations that produce ingredients, and then use those ingredients to cook a variety of dishes for ancient gods and demi-gods from ancient mythologies. Sound strange? It is. Very strange. 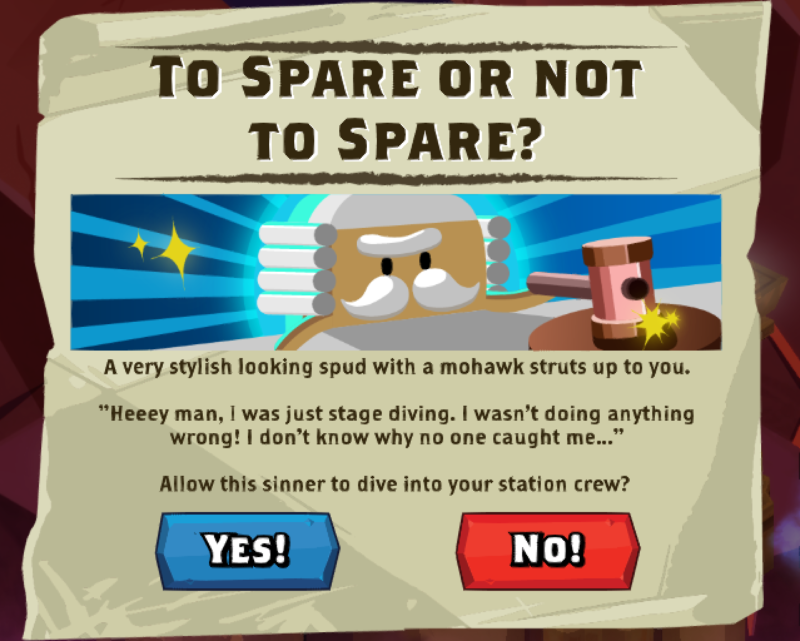 Sort out enough sinners and make enough potatoes to appease the gods and you get rewarded with a cut scene! Good lord. The saving grace is that you can just hit skip on those cutscenes. That is, if you don’t care about seeing 10 minute long, painfully dull animations that force you to click through them as if the six words of inconsequential dialog required serious reflection. Underrail this is not. Almost none of the dialogue is important, and the important stuff requires acknowledgement. Unlike the aforementioned isometric RPG, where you would be well served to go purchase a Moleskine ledger just to take notes during interaction with NPCs, the dialogue in Holy Potatoes moves like molasses and proves to be ultimately superfluous. 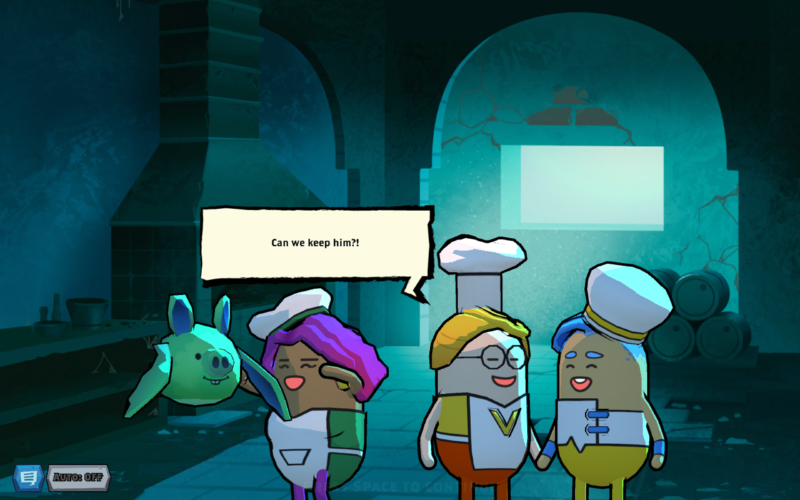 What lies at the core of Holy Potatoes is a rather clever mix of resource management, timing, starch, and puns. In fact, there are more puns in this game than I even know what to do with. If you skip a line of dialog, you have probably skipped at least a dozen puns. 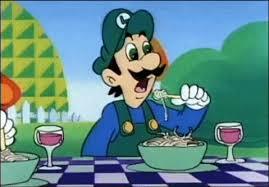 One of the line chefs’ names is Veggil. One of the judges for your first cookoff is named Sephiroot. The evil restaurant owner’s name is Gorodon Yamsay. Trust me, I’m a fan of a good pun, but there is a point where they just become tiresome. I am such a fan of puns that before I boiled potato one, I had to name my restaurant. I chose the name The Squeeze Out, which Sacramento natives will recognize from The Squeeze Inn, where the burgers fry and the cheese flows like wine. I thought it was an innocent joke until I saw this screen, and sat there aghast with what I had done. But that’s just the beginning of the problems here. At the onset, you have to name yourself and create a banner. I’m not going to knock the game for forcing me to take a moniker because, hey, I’ve had one almost my whole life. But if you’ve read more than a few of my articles you probably know that one of my big bugaboos is requiring me to create something that appears to be meaningful before the game even starts. That took the form of the banner, which served no purpose until my first D.E.V.I.L. cookoff. 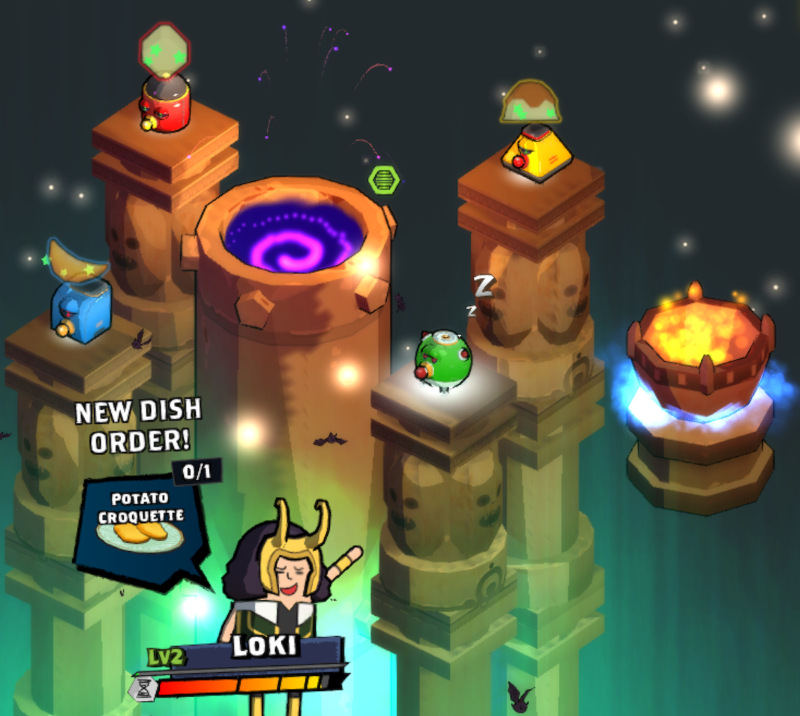 The game takes place over a number of days in each ring of hell, where the goal for each day is to complete a challenge of sorts, generally based on the number of orders completed or the amount of favor you gain by producing higher and higher quality dishes to the gods. The action is relatively fast-paced, but is toned down slightly by pausing automatically when entering certain menus. Try turning off the auto-pause and you will quickly earn yourself a lesson in humility, one where your ability to click through a menu of available dishes will prove you to be a much less discerning chef than you once assumed. It’s at this point that I need to step back and comment on the general feeling of malaise in this review. It’s not that Holy Potatoes is derivative; it isn’t. 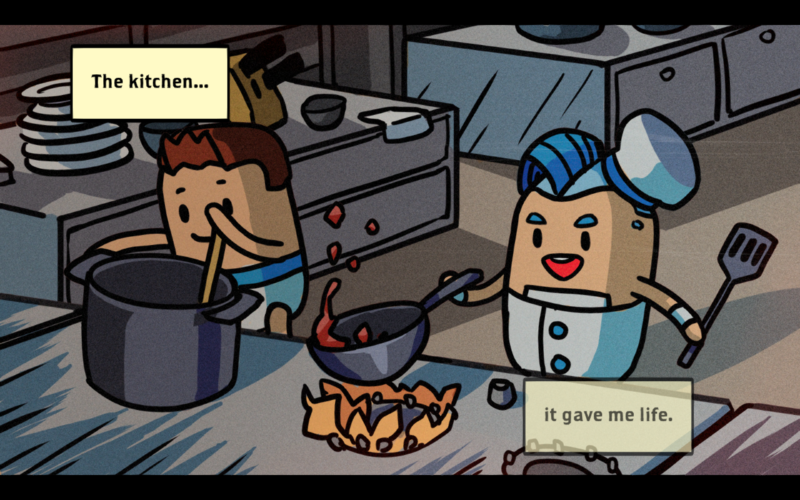 It isn’t much like Burger Time or Job Simulator or any other game that involves a stylized representation of cooking and eating (are there that many?). It also isn’t that it has horrendous graphics, which it also doesn’t: the cell-shading and smooth animations lend themselves quite well to the overall aesthetic. There is just…something off about Holy Potatoes. Something that just isn’t quite right. It’s the pacing. Rather, the entire experience has an inconsistent difficulty curve. Some games throw you into a pit of fire and laugh at you when you get burned. Some games hold your hand the entire game, and by the time you finish, you feel like daddy has just barely let go of you and allowed you to pedal the tricycle on your own when you see the end credits roll (normally, most of those credits are a single person’s name). But Holy Potatoes seems to be stilted in some way. There is no proper tutorial, which is fine, as you get plenty of help in the early game and new items or ingredients are explained as needed. In fact, the actual meat of the gameplay is quite well-executed, if not a bit on the easy side. As you progress, variations and options begin to present themselves in a number of areas- from seasonings, upgrades to dishes, and even the choices you make when sorting out all those sinning spuds. Once you reach a certain point, you are thrown odd curveballs that leave you completely disarmed, unexpectant of the given situation. See, the game starts easy, and continues to be relatively easy thanks to a forgiving learning curve. Sometimes, however, there are difficulty spikes that are just completely out of place. The D.E.V.I.L. cookoff, for example. When I entered the cookoff, none of the rules made sense. I cooked something, slapped around a green flying pig, and after a few rounds I had won. I have no idea how I did so…in fact, if I had to wager on my performance halfway through, I’d have put quite a good bit of money on the other guy. Thankfully, the cookoff was not a game-breaker by any means, and I soon got back to sorting sinners and frying, mashing, boiling, or baking them. This is where the cut scene overkill exacts its real toll. If you bombard me repeatedly with 20-minute cut scenes that move at the blistering pace of a dissertation on Guernica, then all of a sudden, out of nowhere, I am required to actually read something important, we have a bit of a messaging problem, now don’t we? Now, this is no fault of the game, and I admit that, but there is something to be said about economy of words. 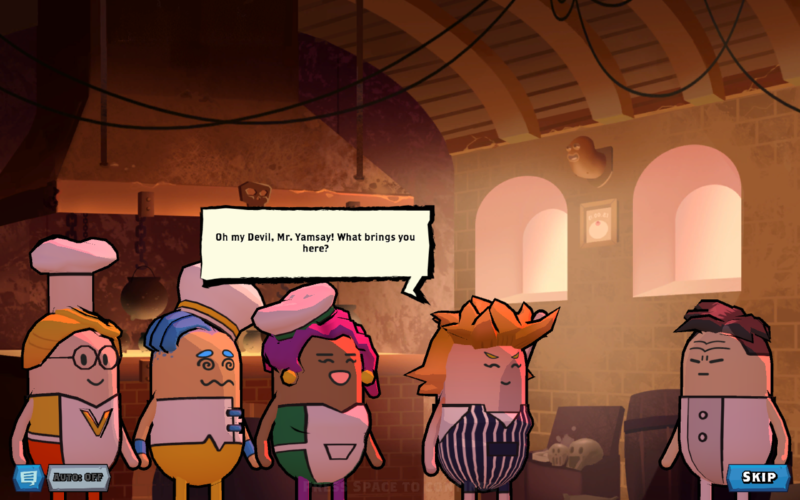 Cut scene overkill aside, Holy Potatoes is a rather cute and clever game that requires some bit of dexterity and quick thinking. If it were more difficult, it would be a real nail-biter, but it has enough challenge to keep you occupied with a colorful and quick-playing casual experience, with enough upgrades and variability of play to keep you interested for a few good sessions. Why not? For a game that is so mired in a swamp of downright somnambulant cut scenes, there is quite a bit of quality gameplay to be had here. Just try not to fall asleep between seatings.